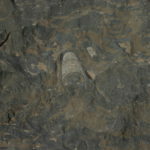 Fossils at the Hamar Laghdad in Morocco. 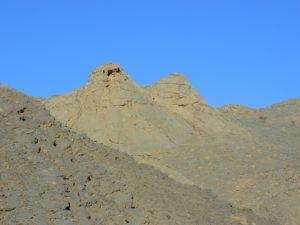 The Hamar Laghdad side is above all famous for its fossils. The Kess-Kess mounds mud located at Hamar Laghdad offer a very interesting and unique geology too. 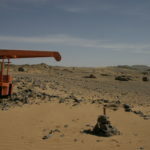 These are the Kess-Kess mud mounds at the Hamar Laghdad ridge. Obviously many fossils can be found in that region between Erfoud and Rissani. But in fact these are mostly the polished Orthocones and Goniatids. Like Sporadoceras or Manticoceras and maybe also Gyroceratites gracilis. This goniatid limetions are been quarried in this region literately for decades. Some of these can be astonishingly beautiful in colour and texture. 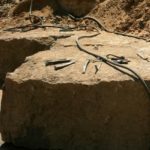 Here are the marble blocks that have just been mined in the Quarry. These blocks are ready for the transportation to Erfoud. This is how the limestone blocks will be mined here. This picture was taken back in 2005. 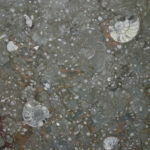 The so called “Fossil Marble” is found directly under the desert sand. This old red dredger is here since decades. It has become a landmark now on the way to the quarry. Mayve it has been around here in late 1960s when Alberty did his research on the Trilobites here. Some of this policed Devonian limestone’s are exceptionally decorative. It is like art just made by nature. 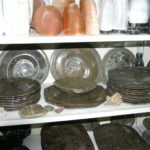 This policed orthicons limestone that is more commonly used on Table plates and decorative stone carvings. It comes in all shapes and sizes and kinds that are conservable. But it is here about fossil and not fossil home decorations. And Palaeozoic fossils from Morocco are mainly Trilobites. 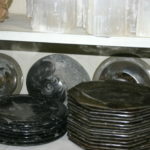 Plates made of orthicon marble. 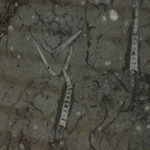 The black ones are maybe mined in a other place called Serdra. That quarry is more close to Tazzarine and the orthicon fossils have a Silurian age. So they are a little older as those from Erfoud. The Polished orthicons as letter weights or just as decoration. Goniatids and plates made of fossil marble as you find them in every well sorted souvenir shop around the world. 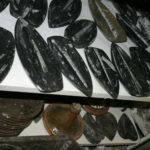 They are a evergreen product that is mined, designed and made in Morocco. 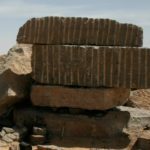 There are no limitations for the creativity of the Moroccan stonemasons. 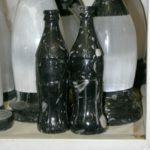 This Stone Coke Bottle is a nice example. Trilobites and other Fossils from the Hamar Laghdad. But it is here about real fossils and not fossil home decorations. And if it is about Palaeozoic fossils from Morocco we talk mainly about Trilobites. But it is here about fossil and not fossil home decorations. And Palaeozoic fossils from Morocco are mainly Trilobites. And back in the 1980 till the early 2000’s nearly every Morocco Bug was claimed to be from the mysterious Hamar Laghdad site. Or at least from the Hamar Laghdad Formation what remains a mystery itself. It is maybe because numerous publications of Alberti from 1969, 1980, 1982 etc. 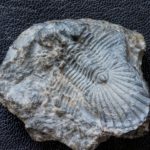 Back in these days they where the Devonian Trilobites of Morocco very poorly researched. Even Pierre Morzadec did had some unconformities in his 2001 paper. 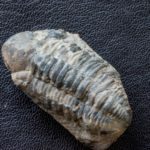 In fact trilobites from the Hamar Laghdad are rare. And even more rarely they are offered. One exception are the red trilobites with green eyes. Those where descried by Christian Klug et all in 2009. Some bug bits and pieces where sold back in the 1980’s. These where not prepared and they are also not likely from the Hamar Laghdad. The Jebel Amlane exposure is located close to the piste to Rissani. And they would likely be labelled to be from Erfoud or Afoud. The Scabriscutellum Lumachella from the lower Pragian of the Hamar Laghdad. A Trilobite of the genus Thysanopeltis from the lower Eifilian of the Hamar Laghdad. A red Trilobite of the genus Proetopeltis from the Hamar-Laghdad. 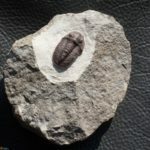 This is a Phacopid Trilobite from the Devonian of the Hamar Laghdad. 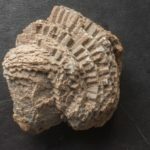 As a nice example of the reef is this fossil Coral of the genus Favosites from the Hamar Laghdad. A very large bivalvia fossil from the Hamar Laghdad. Alberti, G.K.B. 1969. 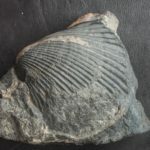 Trilobiten des jüngeren Siluriums sowie des Unter- und Miteldevons. I. Mit Beiträgen zur Silur−Devon−Stratigraphie einiger Gebiete Marokkos und Oberfrankens.Abhandlungen der Senckenbergischen Naturforschenden Gesellschaft 520: 1–692. Alberti, G.K.B. 1980. 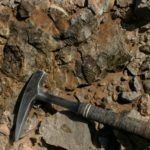 Neue Daten zur Grenze Unter−/Mittel−Devon, vornehmlich aufgrund der Tentaculiten und Trilobiten im Tafilalt (SE−Marokko). Neues Jahrbuch für Geologie und Paläontologie, Monatshefte 1980 (10):581–594. Klug, C., Schulz, H., and De Baets, K. 2009. Red Devonian trilobites with green eyes from Morocco and the silicification of the trilobite exoskeleton. Acta Palaeontologica Polonica 54 (1): 117–123. Morzadec, P. 2001 Les Trilobites Asteropyginae du Dévonien de l’Anti Atlas (Maroc) Palaeontographica. Abteilung A (in French). 244 (1–3): 53–85.